NOV 20 (WTN) – Faction in Congress in Madhya Pradesh is not hidden from anyone. Political analysts believe that due to mutual faction and tactics among the big leaders of the Madhya Pradesh Congress, the Congress had to face defeat in the last assembly elections. In the manner in which Madhya Pradesh assembly elections were seen as a diversion among big leaders, it seems that this faction of Congress does not take anywhere else on the verge of losing the Congress. In the Madhya Pradesh Congress there are many factions of the leaders, but the three leaders’ group is famous. These groups are of Digvijay Singh, Kamal Nath and Jyotiraditya Scindia group. The big question is, if the Congress came to power in Madhya Pradesh, who would be the chief minister? We are saying that because there aren’t only two, three or four names for the chief ministerial post in the Congress party surrounded by factionalism. During the campaigning in Madhya Pradesh, Prime Minister Narendra Modi himself has targeted the Congress saying that there are eight names of the Congress leaders for Chief Ministerial post in public discussion in the Congress. As far as Digvijay Singh is concerned, he has already said that he is not in the race for the post of Chief Minister of Madhya Pradesh. Political thinkers believe that although Digvijay Singh isn’t included in the race to become the Chief Minister, his desire in the Chief Minister post of Madhya Pradesh will be necessary. 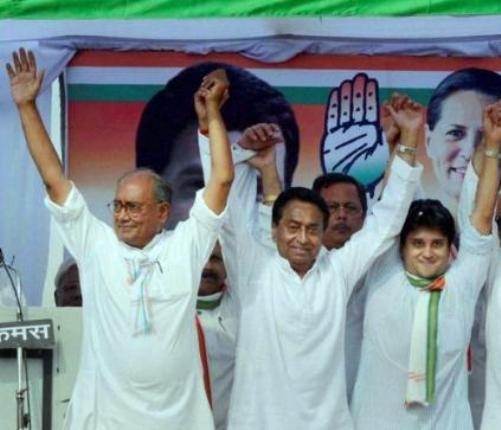 For your information, let you know that Digvijay Singh has been a mass leader of the Madhya Pradesh and his political rivalry with Jyotiraditya Scindia is well sknown. There is speculation that if Congress comes to power, Digvijay Singh will do his best not to make Jyotiraditya Scindia the Chief Minister. The way, in which the news of turbulent debate came between these two leaders during the ticket distribution, it can only be said that Digvijay Singh will be the biggest obstacle in Scindia's path. It is being said that Digvijay Singh can lobby for Ajay Singh to make the Chief Minister. Ajay Singh's father Arjun Singh is called the ‘political guru’ of Digvijay Singh, while Ajay Singh is also very close to Digvijay Singh. These days, when Digvijay Singh has not been allotted the room at Madhya Pradesh Congress headquarters in Bhopal, then he is doing his job from Ajay Singh's room. This closeness between Ajay Singh and Digvijay Singh clearly indicates that Digvijay will make a complete effort to make Ajay Singh Chief Minister if Congress wins. Madhya Pradesh Congress President Kamal Nath is also in the race for the post of Chief Minister. But everyone knows that Kamal Nath is more interested in the politics of the Center rather than the state. In a private news channel's program on the question of becoming the chief minister, Kamal Nath has said, “I am not hungry to become the chief minister.” Further, Kamal Nath said, "If the Congress party came to power in Madhya Pradesh and Rahul Gandhi said that if Jyotiraditya Scindia became Chief Minister of Madhya Pradesh, then I would support his decision and all would work together with Scindia." It is necessary to see now that if the Congress form government in Madhya Pradesh, then it is natural that there will be clash for the Chief Minister post, and if this happens, then what does Rahul Gandhi decide and whose name is finalized? But it doesn’t seem that would not be clash among leaders, because the way it looks like Digvijay Singh seems to be doing so, he will do his best to make his favorable Chief Minister. Kamal Nath has just said that he is agreeing to the name of Jyotiraditya Scindia for the post of Chief Minister but if the time comes, supporters of Kamal Nath can lobbying for him and if this happens then Digvijay Singh, Kamal Nath and Jyotiraditya Scindia, the three groups will face one other. Whatever will be happened, there will be a lot of trouble for Rahul Gandhi.